Gary and Frank welcome two of the great leaders of Chicago’s Pride Films & Plays to Booth One. Nelson Rodriguez is Artistic Director of Pride Films and Plays. Filmmaker Dan Pal is running the Pride Film Fest, which happens on the second Tuesday of each month. Check out the line-up for February’s festival here. Pride Films and Plays brings a 4-show season of excellent LGBTQ programming to the Chicago theatre community. Housed at the Pride Arts Center at 4139 N. Broadway, PFP also hosts the aforementioned Pride Film Fest and rents its two spaces to other theater companies. 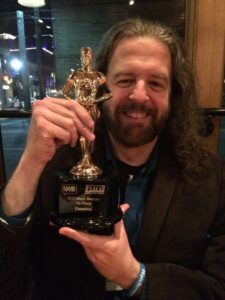 Dan Pal is an award-winning filmmaker and professor at DePaul and Moraine Valley Community College. Check out his website to see the fabulous Scotty & Josh trilogy and more. Here is Dan winning an award for his direction of Counting, which is t he first film produced by Pride Films & Plays. It is on the festival circuit now and headed to the Santa Fe Film Festival in February, where it will open for Melanie Mayron’s new movie. We got a chance to screen this beautiful and moving short film. We’ll keep you posted when it becomes available to the public. Nelson recently starred in a feature film called En Algun Lugar, which we can’t wait to see. He ha s performed in a one-man show depicting 7 gay immigrant characters called “Men on the Verge of a His-Panic Nervous Breakdown.” Would love to see this and hoping for a remount. Nelson has been featured as one of “30 Under 30” in the Windy City Times. Looking forward to all he will continue to bring to our community. Pride Films and Plays was founded by David Zak, longtime artistic director of Bailiwick, who brought us so many memorable productions, including The Christmas Schooner, in which Roscoe, our founding co-host, created the role of Gus. Chita Rivera and Seth Rudetsky did what sounded like an amazing show at Steppenwolf. We had to miss because of a conflict, but sent our friends and loyal listeners with only one request: that they write a short review. Gary shares the a few observations made by Virginia Gerst, Nancy Needles, and Kay Ellwein. We appreciate the excellent reporting and wish we’d been there with you. BTW, we interviewed Chita in episode 32. Check it out. Frank Tourangeau, our new regular guest host, geeks out on I Love Lucy in a fascinating way. If you didn’t already know how the DesiLu empire started, you’ll hear it on this show. They also invented the rerun. Geniuses both. We close each episode with a tribute to a fascinating person who has recently passed away. Learn about Johnny Fox, sword swallower. Ick.